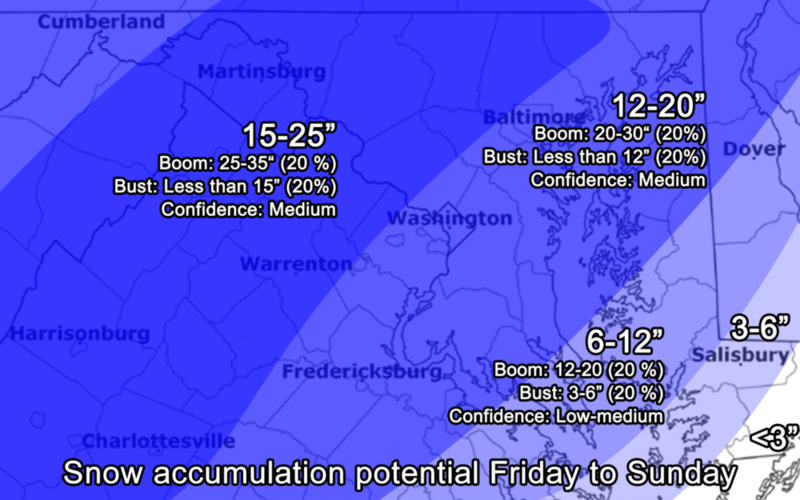 Capital Weather Gang's Wednesday snow total predicton. For those of you who may have been living under a rock today, I thought I’d send this short storm update. The National Weather Service issued a “blizzard watch.” A “watch” is defined in this situation as the “[p]ossibility that Blizzard Warning Criteria may be met at longer ranges (24 to 48 hrs out).” Blizzard conditions are described as frequent wind gusts of 35+ mph and visibilities due to blowing snow of ¼ mile or less for 3+ hours. Most of the weather computer models are updated in the evening/night starting at about 8:00 p.m. and going through midnight. Tonight’s model runs will begin to firm up the storm track. Thursday night’s model runs should give us a highly-accurate storm track and will also tell us how much uncertainty is built into those model runs. For the record, my prediction is that the government will be open with liberal leave in effect on Friday. I further predict that the government will close early when the flakes start to fly, probably about 3:00 p.m. I’m holding off on my snow-total prediction until tomorrow evening.